Priano-Keyser's broken Apple Watch Series 3. Filed on behalf of plaintiff Gina Priano-Keyser through the U.S. District Court for New Jersey, the suit argues Apple is committing fraud and breach of warranty, often choosing to label incidents accidents and deny discounted warranty repairs. The company has offered free repairs in the past. 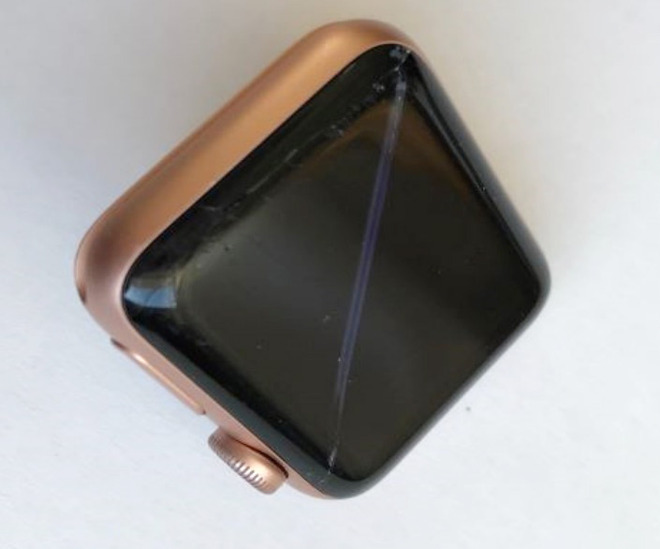 In the complaint, lawyers for Priano-Keyser say she bought a Series 3 Watch in Oct. 2017, and that in July the next year its screen suddenly detached and cracked during charging. Her daughter tried to push the screen back in, but the Watch has reportedly been "unusable" since. As evidence of a broader trend the complaint points to more than a dozen similar anecdotes on Apple's support forums over a matter of years. It also suggests that the situation is a potential safety hazard, as some people have already suffered "cuts and burns." Attorneys are pursuing class action status, the defined class being any New Jersey resident who's a present or former owner of a Series 1, 2, or 3 bought in the state. A similar suit by the same lawfirm — Shepherd, Finkelman, Miller & Shah — was launched in California last summer, but dismissed in large part because it didn't identify a responsible defect. That issue is addressed here, specifically pointing to "aging or otherwise faulty" lithium-ion batteries, or else other defective components that might impact them.